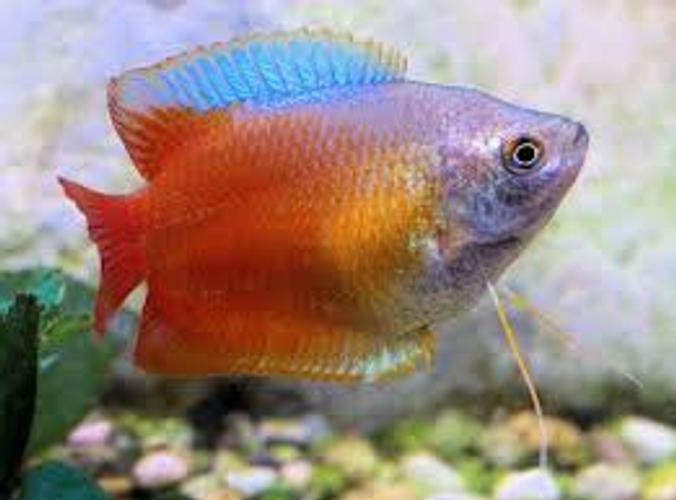 If you are looking for a peaceful community fish that gets along well with other docile species, look no further than the dwarf gourami. 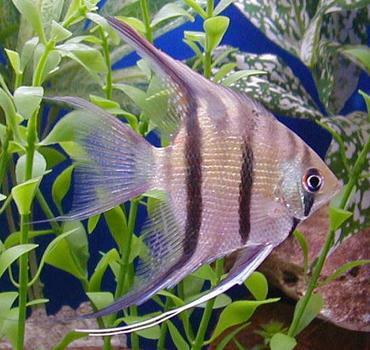 The dwarf gourami (Trichogaster lalius) is a very popular species, known for its brilliant blue coloration and for its calm demeanor. 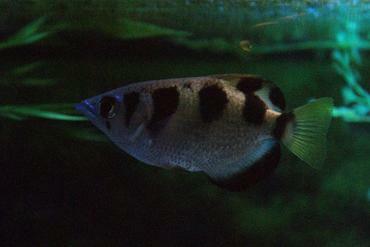 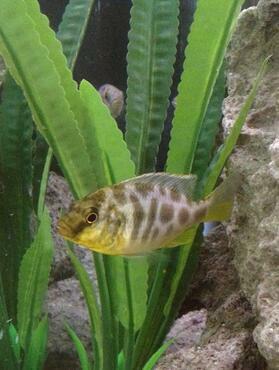 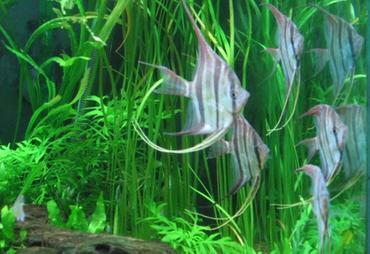 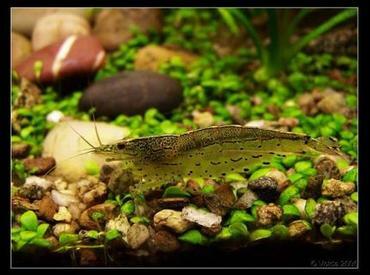 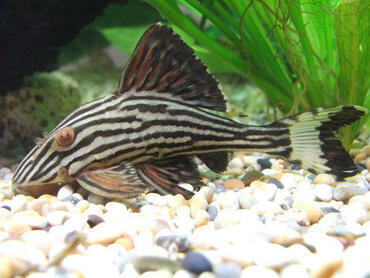 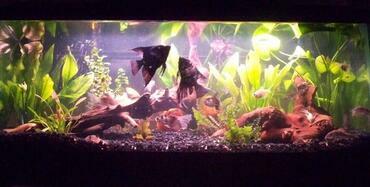 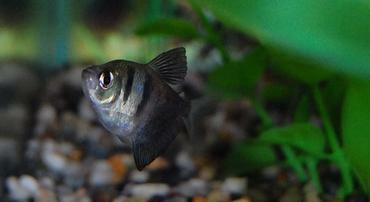 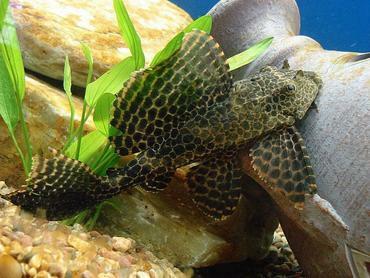 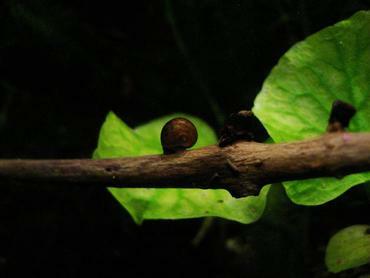 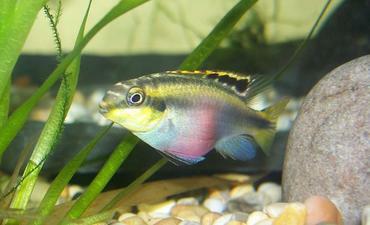 This species does very well in the community tank and it is generally not a difficult species to care for. 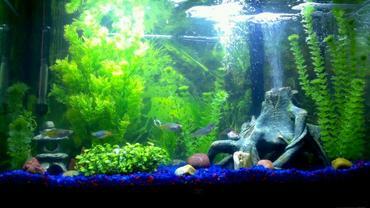 If you are thinking about keeping dwarf gouramis, take the time to learn everything about them in terms of their ideal tank parameters, diet preferences, and the diseases to which they are prone. 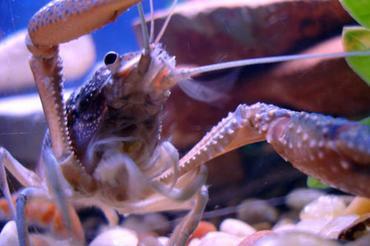 You will find all of this information and more in this article. 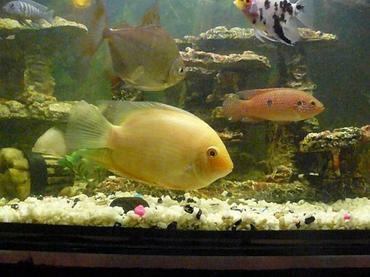 The dwarf gourami is native to certain areas in Bangladesh, India and Pakistan, though almost all of the specimens you find available for sale are captive-bred. 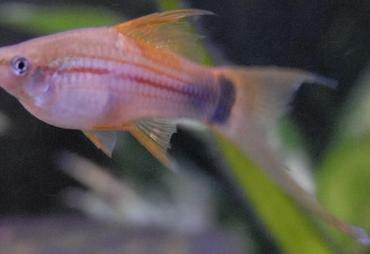 This species grows to a maximum length of 3 ½ inches (8.8 cm), though there are some reports of dwarf gouramis growing larger in the wild. 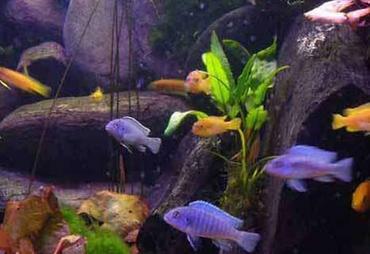 In the home aquarium, male dwarf gouramis typically max out at 3 inches while females remain a little smaller, around 2.4 inches. 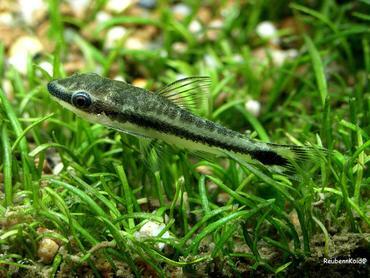 Because these fish remain fairly small they do not require a very large tank, though a larger tank is never a bad idea, especially if you plan to keep this species in groups. 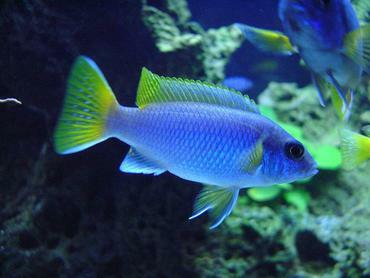 Dwarf gouramis are primarily named for their small size as compared to other gourami species. 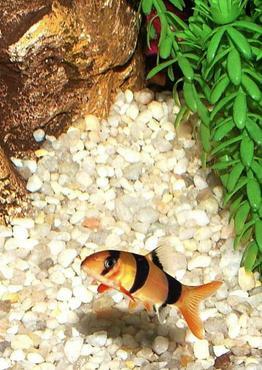 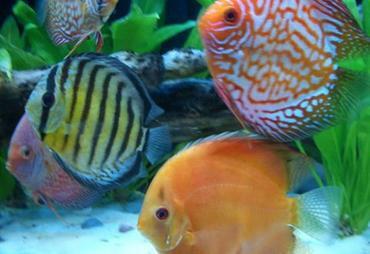 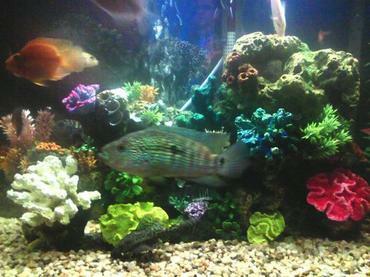 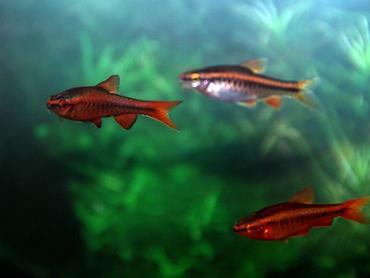 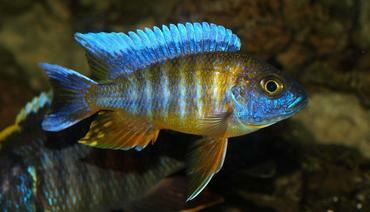 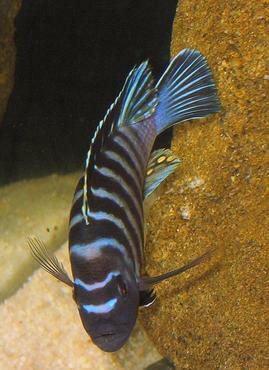 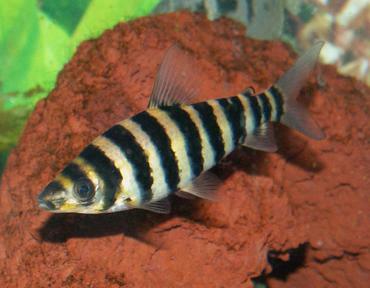 These fish exhibit a bright blue background coloration with brilliant red or dark orange striping. 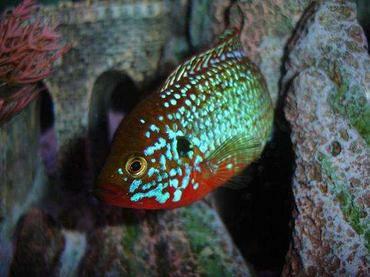 Due to this patterning, the dwarf gourami is also sometimes referred to as the dwarf banded gourami. 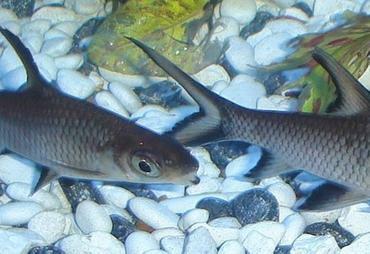 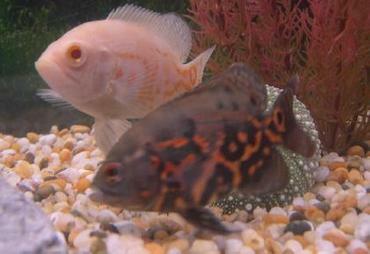 These fish are typically very peaceful in the community tank – they can even be a little bit shy. 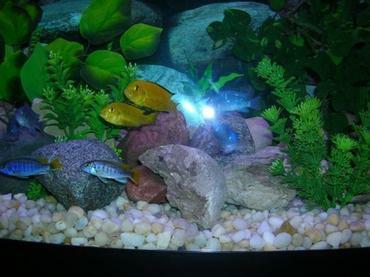 In certain situations, however, the dwarf gourami can become territorial, especially when kept in a tank that is too small. 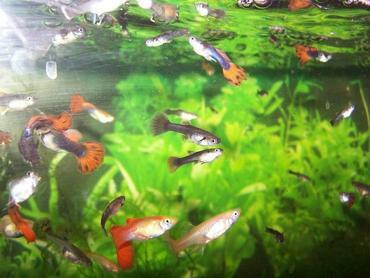 When kept in large tanks with other peaceful community species, however, the dwarf gourami usually doesn’t cause any problems. 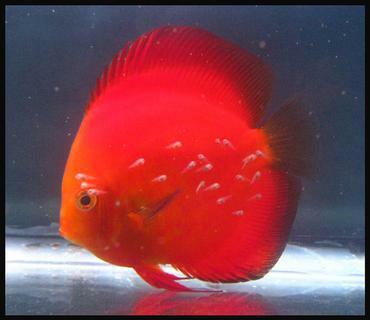 The minimum recommended tank size for the dwarf gourami is about 15 gallons – that is an appropriate size for a pair of dwarf gouramis. 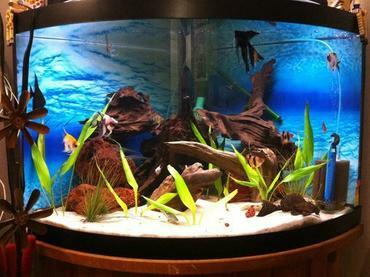 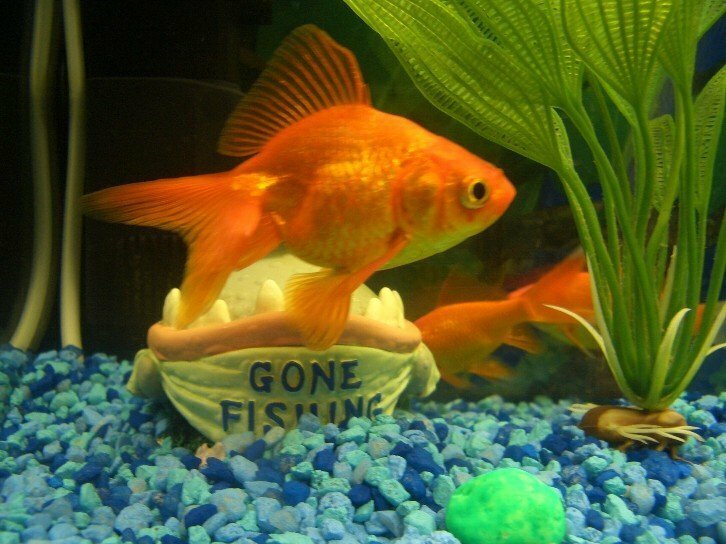 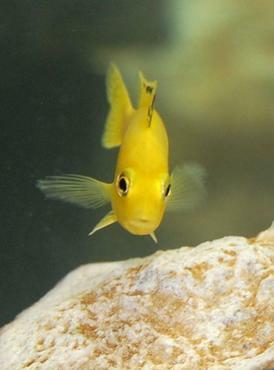 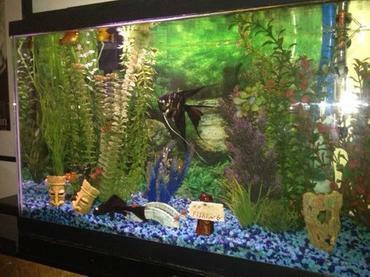 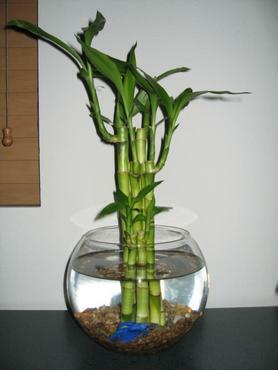 If you plan to keep a group of these fish, or if you want to keep them in a community tank with other species, you should use a much larger tank. 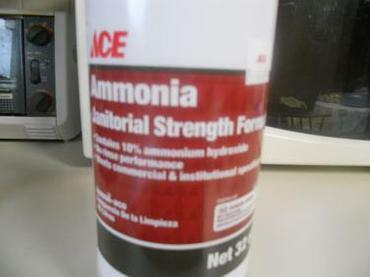 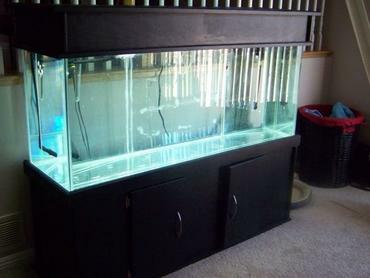 It is a common misconception that smaller tanks are easier to maintain than larger tanks. 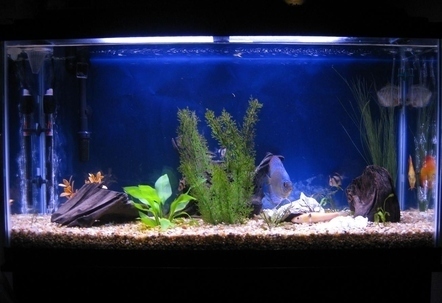 In fact, the opposite is true – larger tanks have greater water volumes which means that small changes in water chemistry are more diluted and less likely to cause a problem than they would in a smaller tank. 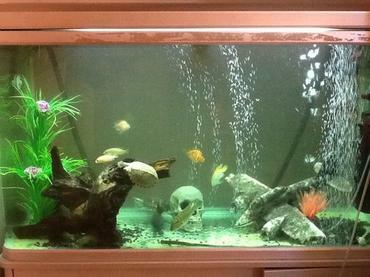 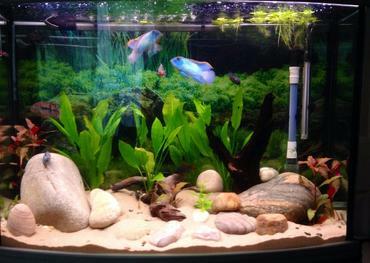 If you are only keeping a few dwarf gouramis in the tank, a 20-gallon tank should be fine. 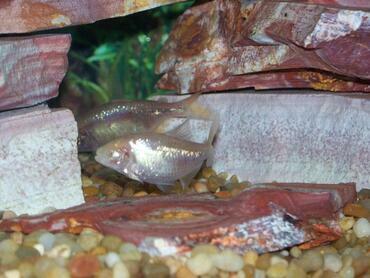 In terms of water conditions, the dwarf gourami is a fairly hardy species. 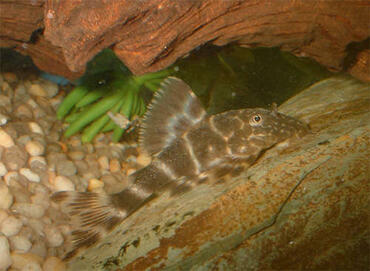 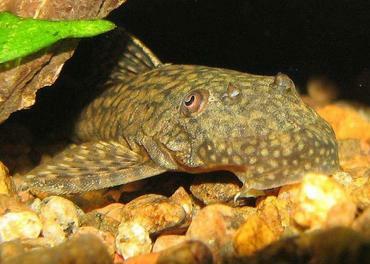 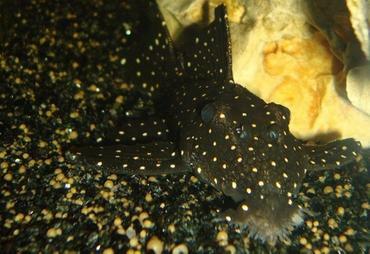 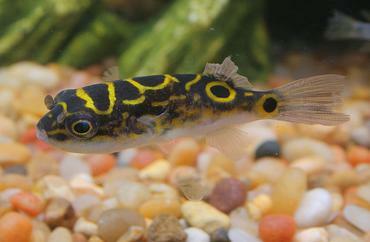 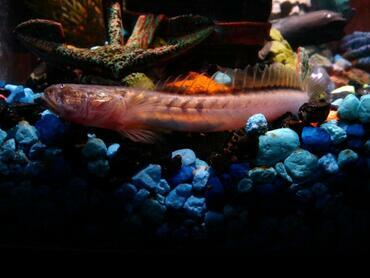 In the wild, these fish prefer sluggish bodies of water (like ponds, swamps, and ditches) with heavy vegetation. 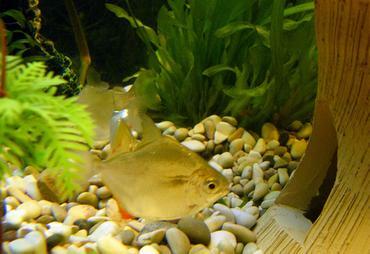 In the home aquarium, dwarf gouramis prefer low water flow and heavy planting. 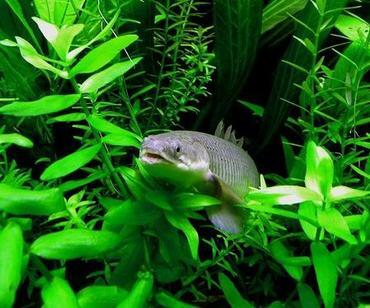 Because the dwarf gourami can be a little shy, using plenty of vegetation in your tank will be important to provide hiding places. 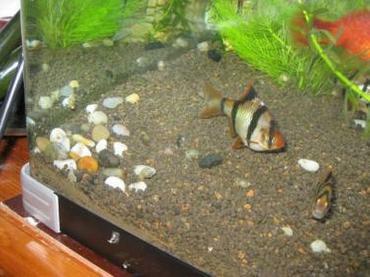 This is especially important if you keep both males and females in one tank – the females will need a place to hide and rest if the males are harassing them. 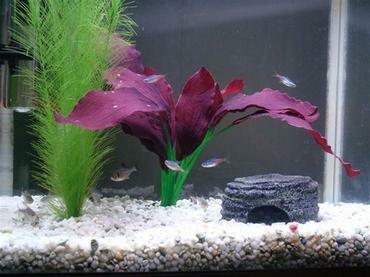 Dwarf gouramis that are kept in sparsely decorated tanks or tanks with too much bright lighting tend to become shy and withdrawn. 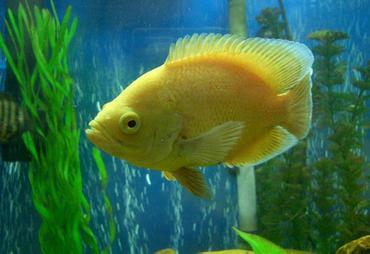 The ideal temperature range for the dwarf gourami is 72 to 82 degrees Fahrenheit. 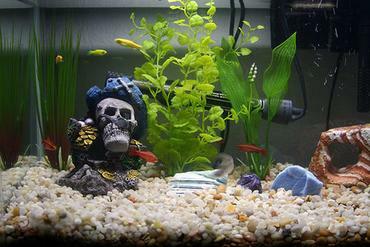 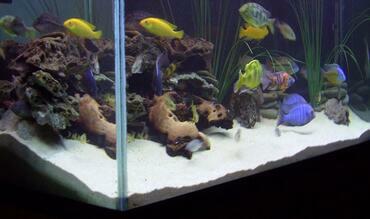 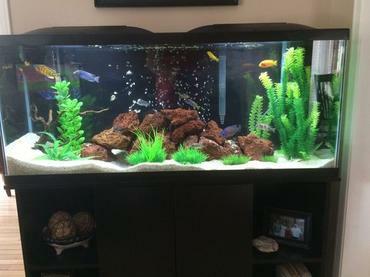 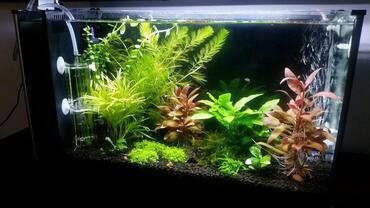 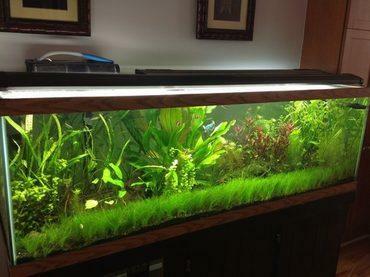 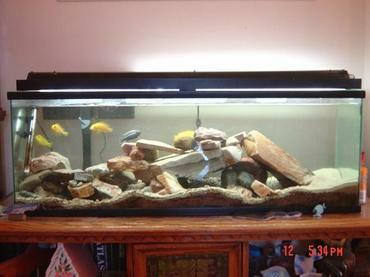 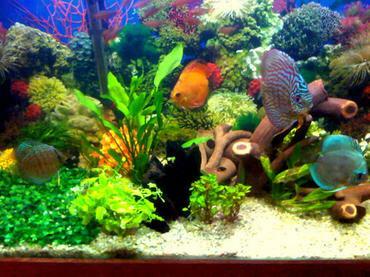 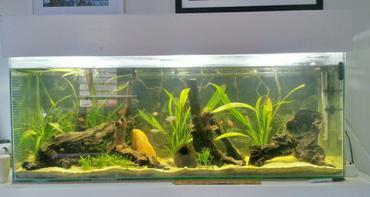 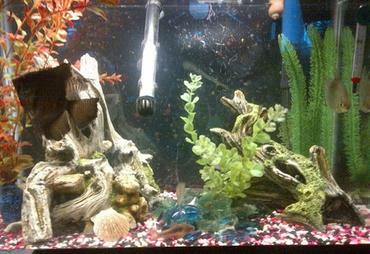 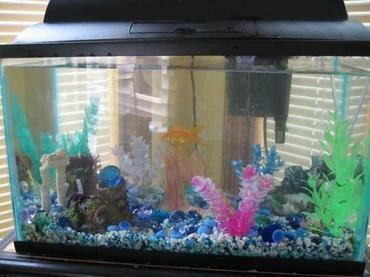 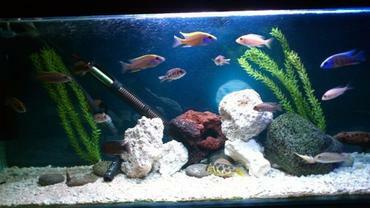 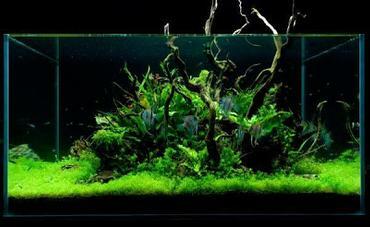 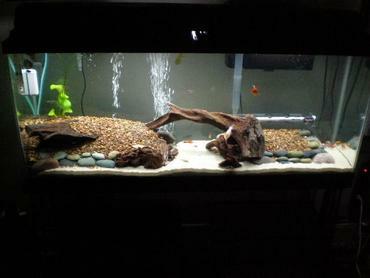 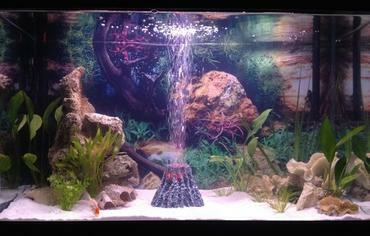 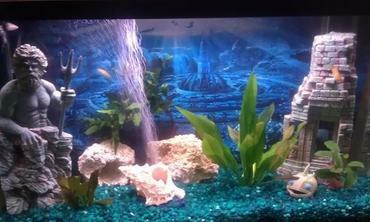 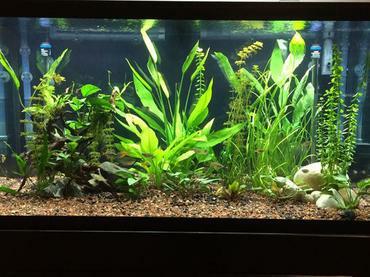 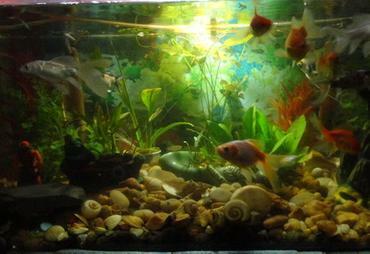 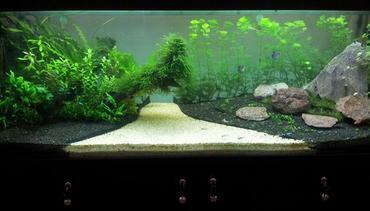 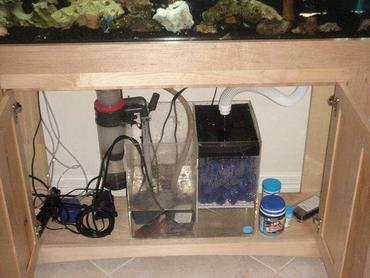 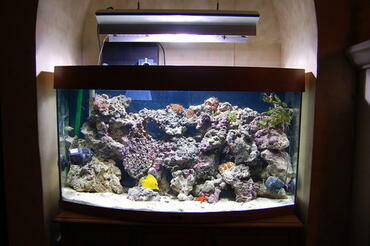 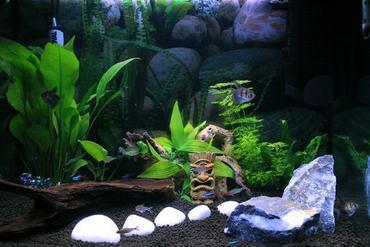 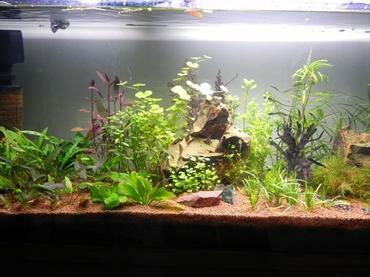 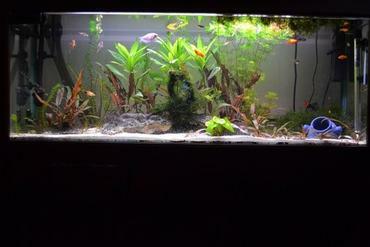 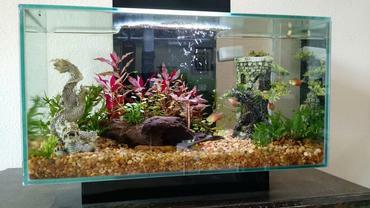 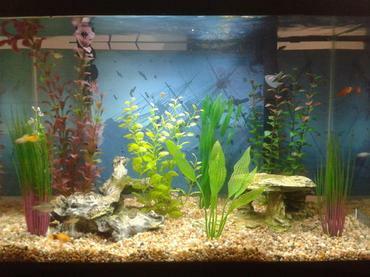 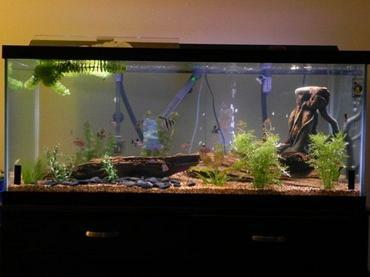 In order to achieve and maintain this temperature you should equip your tank with a high-quality aquarium heater. 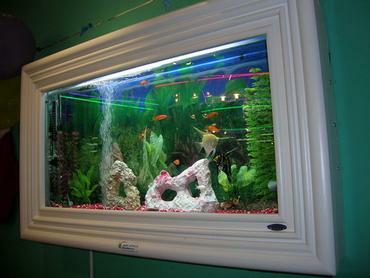 Most aquarium heaters allow you to set a specific temperature, but some are programed to maintain a certain range. 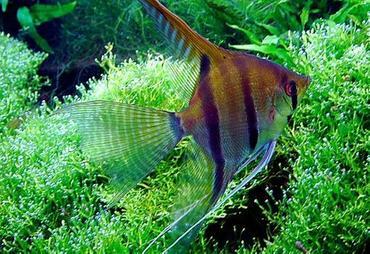 Although dwarf gouramis do not appreciate turbulent water, you still need some type of filtration system to maintain high water quality. 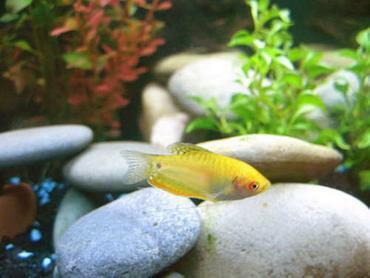 A canister filter or hang-on filter with an adjustable flow rate will be ideal for a dwarf gourami tank. 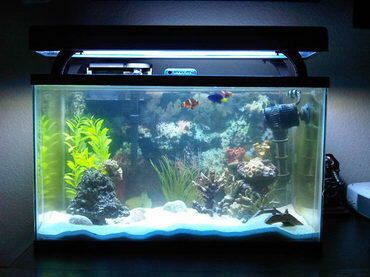 In terms of water chemistry, aim for a pH between 6.0 and 7.5 with a water hardness between 2 and 18 degrees hardness. 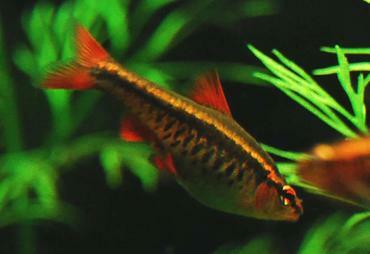 In the wild, the dwarf gourami is an omnivorous species that feeds on algae, small invertebrates, and other creatures. 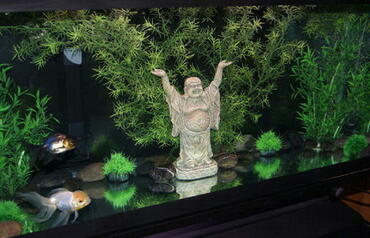 In the home aquarium the dwarf gourami is typically not very picky, accepting most foods that it is offered. 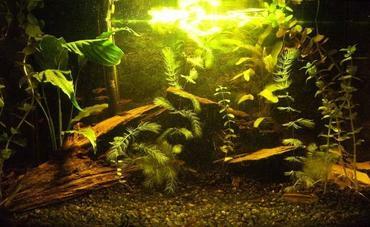 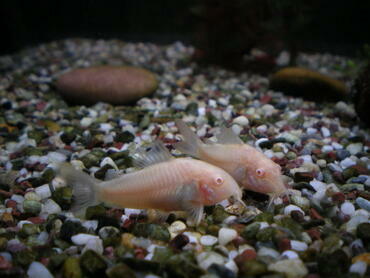 The ideal staple diet for dwarf gouramis, however, is a high-quality dried food (such as flakes or pellets). 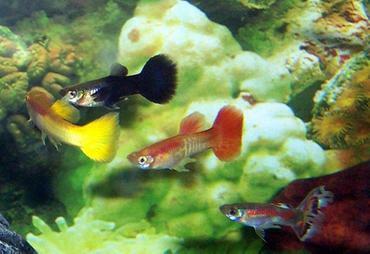 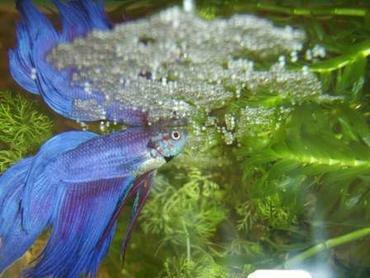 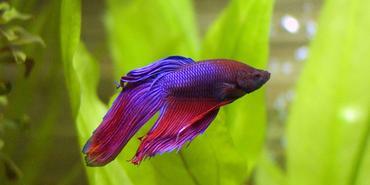 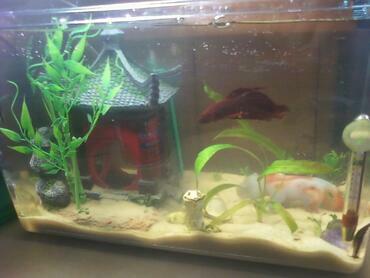 This diet should be supplemented with small amounts of live or frozen foods including bloodworms, brine shrimp, and tubifex worms, to promote optimal health and coloration. 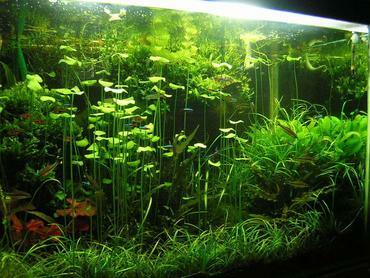 You can also offer your dwarf gouramis some fresh vegetables, though not all specimens of this species will enjoy fresh vegetables. 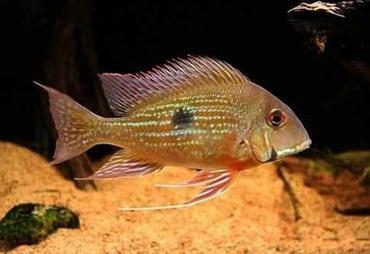 Though the dwarf gourami is typically a hardy and healthy species, it is prone to developing certain diseases just like all other aquarium fish. 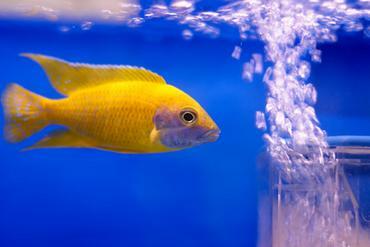 The key to keeping your dwarf gouramis healthy is to maintain high water quality in your tank by installing a filtration system and maintaining a schedule for routine water changes. 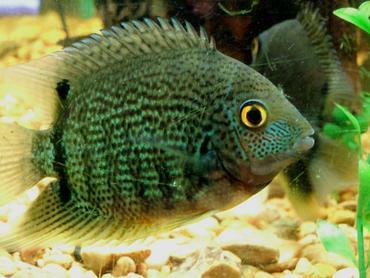 Though the dwarf gourami may be prone to developing a number of diseases when exposed to certain bacteria or parasites, one of the diseases most commonly connected to this species is dwarf gourami iridovirus. 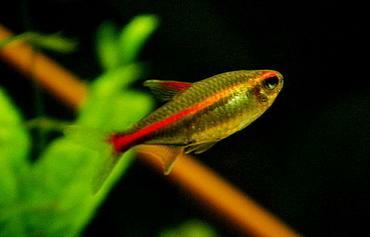 This viral disease is primarily known to affect the dwarf gourami, though it has been seen in some other species as well, including the sunset and the neon gourami. 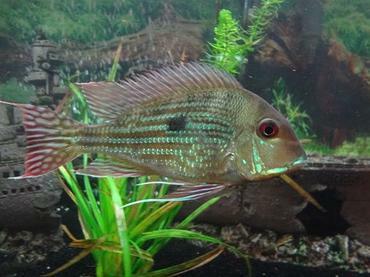 The symptoms most commonly associated with dwarf gourami iridovirus include lethargy, loss of color, sores and lesions, loss of appetite, abdominal swelling, and sudden death. 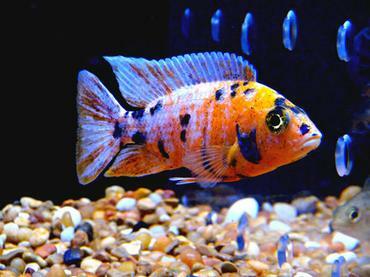 This viral disease is highly contagious so it can spread quickly from one fish to others in the tank if you do not spot it early and quarantine the affected fish. 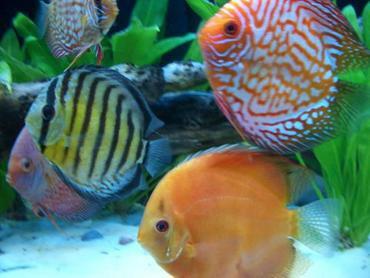 Though it is not a guarantee that your dwarf gouramis will develop this disease, a recent study revealed that 22% of dwarf gouramis coming out of Singapore are carriers of the virus. 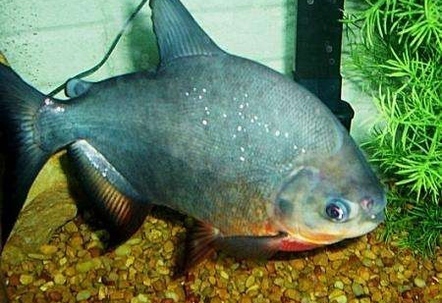 Unfortunately there is no treatment for this disease at the current time and most gouramis that develop symptoms eventually die. 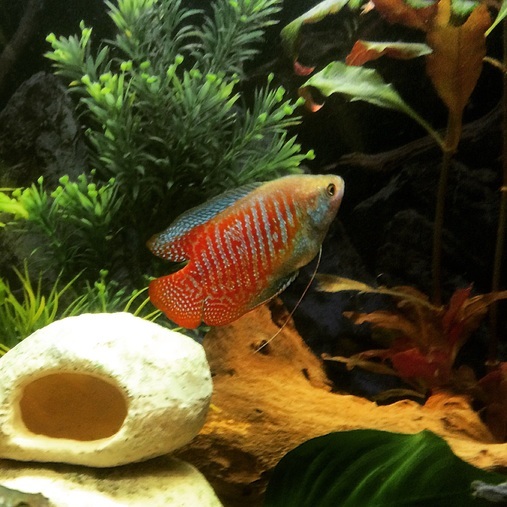 The dwarf gourami is not just a beautiful species to keep in the home aquarium – it is a very unique and interesting species as well. 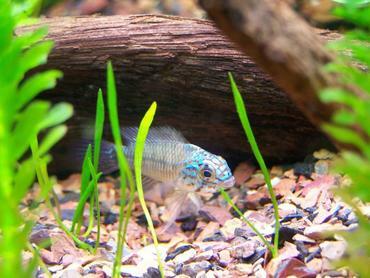 Like many anabantoid species, the dwarf gourami is a bubble-nester and it breeds fairly readily in the home aquarium. 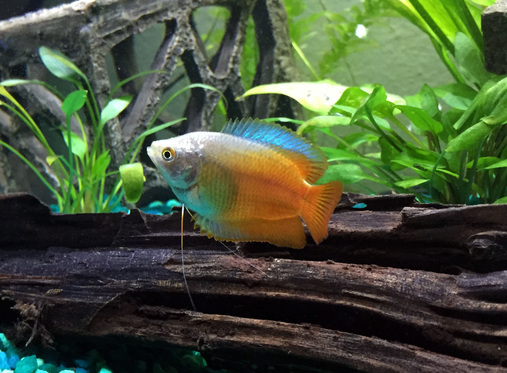 If you are looking for a colorful and peaceful species to add to your community tank, or if you are looking for a species to try your hand at aquarium fish breeding, the dwarf gourami might be a good option to consider.